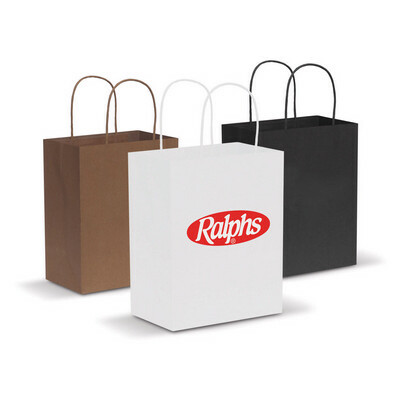 Small high gloss carry bag made from 157gsm laminated art paper. Colours: White, Black. Dimension: H 210mm x W 133mm x Gusset 82mm (excludes handles). Print Description: 100mm x 120mm (one colour). Print Type: Screen Print. Packing: Loose packed. 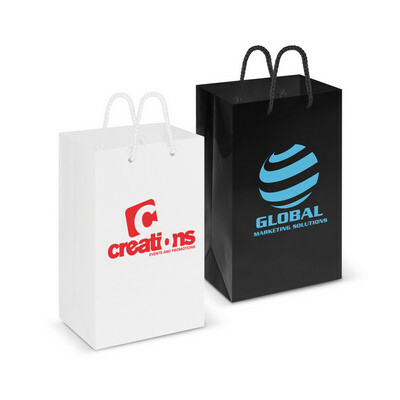 Medium high gloss carry bag made from 157gsm laminated art paper. Colours: White, Black. Dimension: H 245mm x W 201mm x Gusset 120mm (excludes handles). Print Description: 150mm x 140mm (one colour). Print Type: Screen Print. Packing: Loose packed. Small carry bag made from tough 160gsm paper. 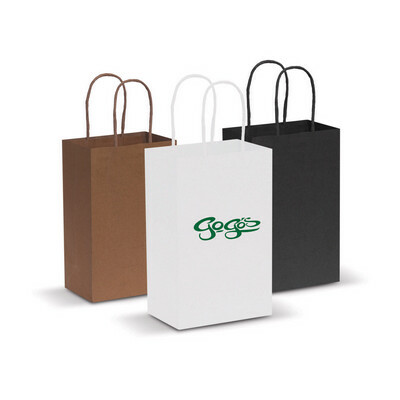 The Natural and Black colours are recycled paper. Colours: Natural, White, Black. Dimension: H 210mm x W 133mm x Gusset 82mm (excludes handles). Print Description: 100mm x 120mm (one colour). Print Type: Screen Print. Packing: Loose packed. Medium carry bag made from tough 160gsm paper. The Natural and Black colours are recycled paper. Colours: Natural, White, Black. Dimension: H 248mm x W 196mm x Gusset 120mm (excludes handles). Print Description: 150mm x 150mm (one colour). Print Type: Screen Print. Packing: Loose packed. 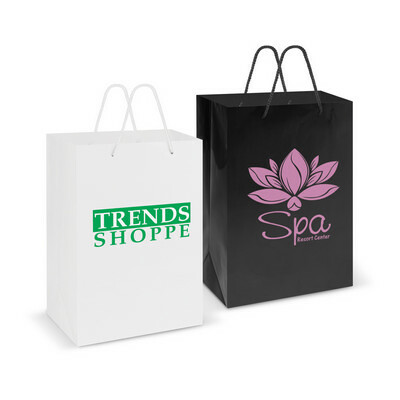 Large high gloss carry bag made from 157gsm laminated art paper. Colours: White, Black. Dimension: H 328mm x W 254mm x Gusset 126mm (excludes handles). Print Description: 200mm x 200mm (one colour). Print Type: Screen Print. Packing: Loose packed. 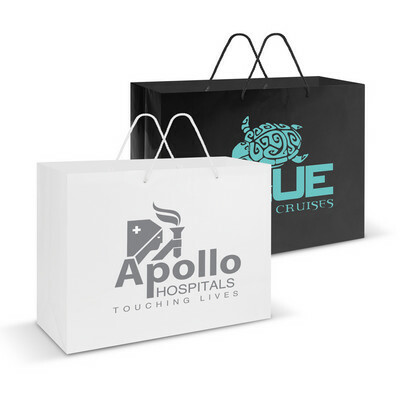 Extra large high gloss carry bag made from 157gsm laminated art paper. Colours: White, Black. Dimension: H 305mm x W 405mm x Gusset 149mm (excludes handles). Print Description: 300 x 200 (one colour). Print Type: Screen Print. Packing: Loose packed. 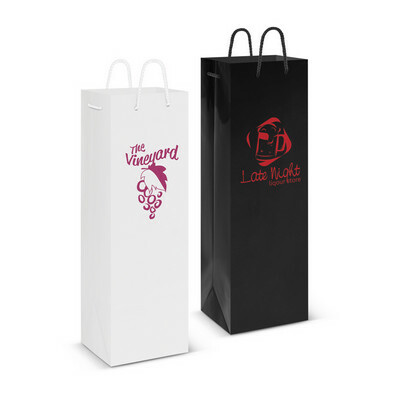 High gloss wine bag made from 157gsm laminated art paper. Colours: White, Black. Dimension: H 357mm x W 120mm x Gusset 90mm (excludes handles). Print Description: 90mm x 250mm (one colour). Print Type: Screen Print. Packing: Loose packed. 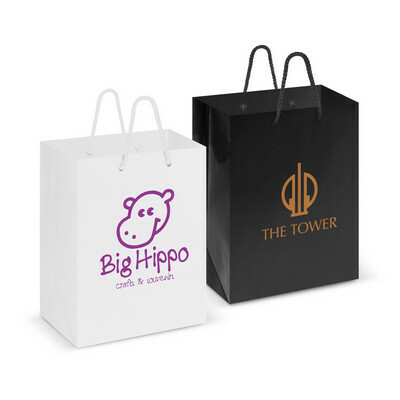 Extra large carry bag made from tough 160gsm paper. 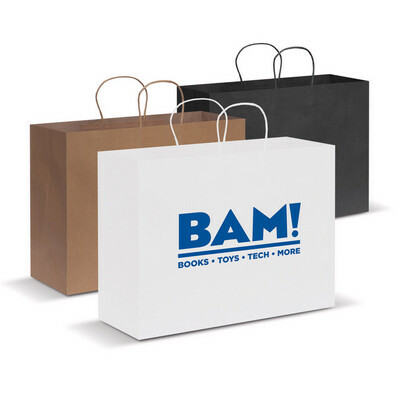 The Natural and Black colours are recycled paper. Colours: Natural, White, Black. Dimension: H 305mm x W 406mm x Gusset 154mm (excludes handles). Print Description: 300mm x 200mm (one colour). Print Type: Screen Print. Packing: Loose packed. 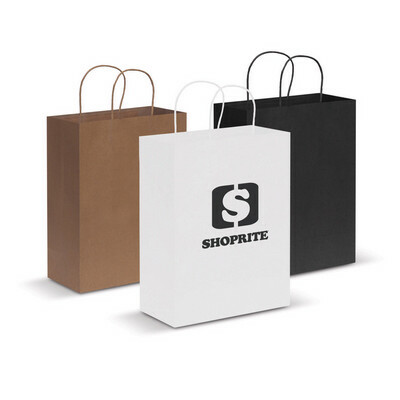 Large carry bag made from tough 160gsm paper. The Natural and Black colours are recycled paper. Colours: Natural, White, Black. Dimension: H 330mm x W 254mm x Gusset 127mm (excludes handles). Print Description: 200mm x 200mm (one colour). Print Type: Screen Print. Packing: Loose packed.